This page is dedicated to some of Esterbrook's other offerings which don't fit in anywhere else on the site. These are typically late production models. This is a late model ballpoint. This appears to be a salesman's sample, advertising "The Portrait Pencil A Distinctive Gift Style #PSC-8"
This Ballpoint looks almost exactly like a Cross Ballpoint, but is marked Esterbrook 12KT. G.F. U.S.A. There were a few variations of this, including a pencil. This is a Convert-a-line ballpoint. It was named as such due to the fact you could convert it into a felt tip pen. 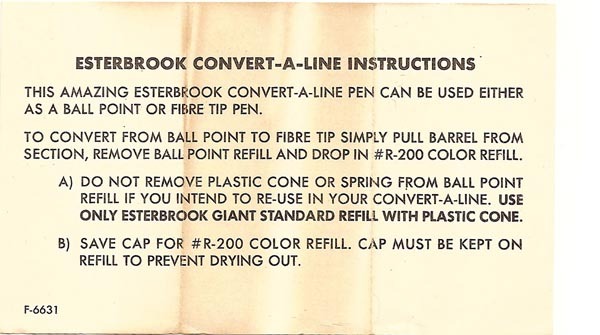 Instructions for this pen can be found here. This is a lady's ballpoint in a brushed gold finish. This was called the Prelude.